Even though I already know how it ends, the ending still gets me every time. Reflection: I had forgotten how much the death in this book rocked me at my first reading, now though, I'm far too distracted by the TERF's overuse of "savage" in all it's forms to be too emotionally attached to anything. Though the use of the racial slur is frustrating, what oddly bothers me more is that it's used so often, as if Rowling lacked access to a thesaurus. Re-read #??? completed 12/6/14 (1st re-read via audiobook): Well. It's so interesting to see how much my opinion has either stayed the same or changed with my re-read after so many years. The Half-Blood Prince was one of my favorites since the last time I read it (at least 5 years ago if not 10. Clearly I was not good at keeping track) and I think it's safe to say that it's still my favorite of the entire series. I love everything that happens with Harry's knowledge and seeking of information about how Lord Voldemort is as well as the fact that the book still largely takes place at school (I still love book seven but the fact that Hogwarts is mostly missing is something that I really did miss from the book). It may be in part since I realized that I actually haven't seen the movie in forever so the book was really in the forefront of my mind instead of the movie version of events... I also am not a huge fan of movie Ginny and she still feels very much like a secondary character in this book still but she's starting to really have more of a presence. I tried to put movie Ginny out of my mind and it helped a bit (poor Bonnie) and the relationship between Harry and Ginny in the book is SOOOOOO much more natural than in the movies. Anyway. Love the information we get in this book. Still solidly one of my favorites -- no wait. My actual favorite -- of the series. I felt a bit of pressure before starting HARRY POTTER AND THE HALF-BLOOD PRINCE. It’s been a long time since I’ve re-read all of the books but I always claimed this one as my favorite of the series. After realizing how much my opinion of ORDER OF THE PHOENIX had changed, I was totally unsure of how HBP would go. Right off the bat, though, I was still in love. I just love how this book really brings everything to the next level — from the plot to the adventure, Quidditch to romances — everything just gets bigger and better in HALF-BLOOD PRINCE. I think one of my favorite things about it is the introduction to Horcruxes. I just really love the layers that it adds to the plot and how it adds another sense of adventure for the characters. I also really, really love that we get to know more about the villain’s past. I LOVE when the reader gets to know more about the villain and his backstory. I think it adds so much to a book and even makes that villain a bit more human — whether that’s by a little or a lot. We all know how amazing J.K. Rowling is at her world building in these books so I guess I should never be surprised but that really is one of my favorite things about the entire series. I really wasn’t big on many of the romances in this series. For me, Harry Potter was always more about action, adventure, friendship, learning, and well… magic. Movie Ginny kind of ruined book Ginny for me so I was really trying to give book Ginny another shot since I know where this story goes… I felt like she actually wasn’t hugely present in HALF-BLOOD PRINCE still so I didn’t feel like I had the opportunity to be bothered or charmed by her. She did make many appearances at the Slug Club parties and Quidditch matches, etc but for some reason I still felt like she wasn’t a very big character… I’m really interested to see how I feel about her in book seven because so far reading the books, I still don’t feel a lot! I do, of course, love the Ron and Hermione romance. You know I love best friendships turning into something more and this was a long time coming. It’s really interesting to see how this tension has slowly built and comes to its breaking point at the end of HALF-BLOOD PRINCE. As always, I love the layers upon layers of world building. From getting to know more about Voldemort to the different classes the students take to the different places they visit… I just love getting lost in this world and something about the writing just makes me feel like it’s a real place, just out of my reach. I always love learning more about magic and what the rules are and what the limitations are. The Felix Felicis chapter is still one of my favorites and the cave scene at the end still creeps me out a lot. Then of course we have Dumbledore’s death. I’m not sure why — maybe I know the books/movies too well? — but I never really feel shaken by the deaths in these books (except for probably Fred, oh god, how will I read that) so I really didn’t get too worked up over his death… But I think for Dumbledore, it doesn’t really feel like he’s gone, you know? His portrait is in the headmaster’s office and we know he sort of… appears to Harry in the final book too. It’s Dumbledore. He’s the greatest wizard of all time. He may be dead but only kind of? 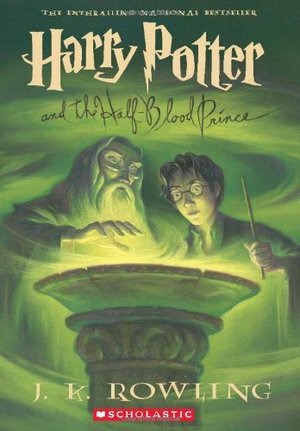 The great news is that HARRY POTTER AND THE HALF-BLOOD PRINCE still stands as my favorite of the series so far! I was never able to place my love for the final book so it’ll be interesting to see where I come out on this re-read! This book didn't do a whole lot for me. It wasn't bad, but it was depressing and felt kind of like it dragged at times. And I'm not a Snape fan at all, so that didn't help.